I love yellow fin tuna. It is also known as Ahi Tuna and can be prepared in so many ways. 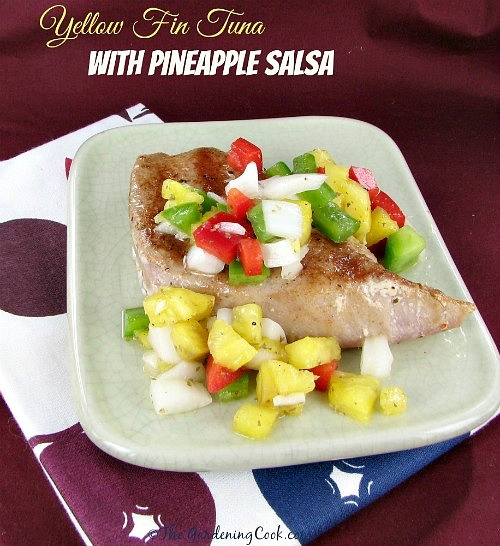 Today’s recipe for yellow fin tuna with pineapple salsa is easy to make and the pineapple adds a great freshness to the recipe. 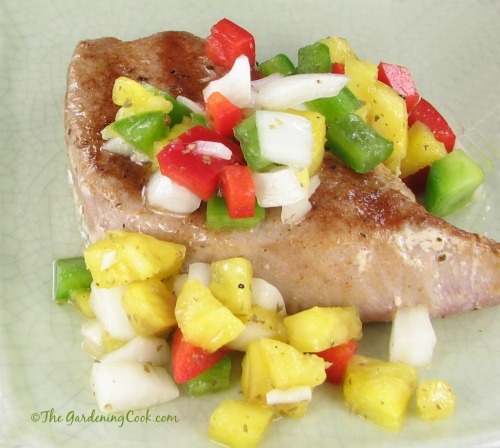 Add a touch of freshness to dinner with this Yellow Fin Tuna with Pineapple Salsa. The salsa is super easy to make. It is so quick that you can even make it while the tuna is cooking, but tastes even better if you prepare it a little ahead of time to allow the flavors in the salsa to combine well. I recently tried a Briefton’s Mini Food chopper and it’s perfect for this type of recipe. Just place your veggies in the bowl, add the cover and give it a couple of pulls to chop the veggies in a flash. The olive oil, lime juice, cilantro and vinegar combine with the veggies to give them a wonderfully tart finish. Perfect on the fish! I like to cook my tuna fairly rare. It is one fish that you can do this way that does not taste “fishy,” which is a pet peeve of me. Serve with a baked potato or side salad for an easy and delicious week night meal. It is on the table in just a few minutes. Aren’t the colors of this yellow fin tuna with pineapple salsa great? What could be more perfect for a warm summer evening? Today's recipe for yellow fin tuna with pineapple salsa is easy to make and the pineapple adds a great freshness to the recipe. Dice the pineapple slices (discard the tough core portions) and place in a medium sized bowl. Add the white onion, bell pepper, vinegar, lime juice, cilantro and minced garlic. Drizzle with 3 tbsp of the olive oil and stir well to combine. Season with 1/2 teaspoon of the Kosher salt and set aside as you prepare the tuna. Set a grill pan over medium-high heat. Season the tuna steaks with remaining salt and Emeril's Essence and brush with the 2 remaining tablespoons of the olive oil. Place steaks on a grill pan, turning after 2 minutes. Repeat on the other side for an additional 2 minutes or until medium-rare. Remove from heat and set aside. Serve with the Pineapple Salsa. I would use this to prepare the veggies for stuffing in my stuffed peppers. Love freshly prepared pesto sauce so that’s the first thing I’ll be using it to make should I win. Thank you for the chance! Such a great recipe! I would love to try and make this salsa with a Brieftons Food Chopper! 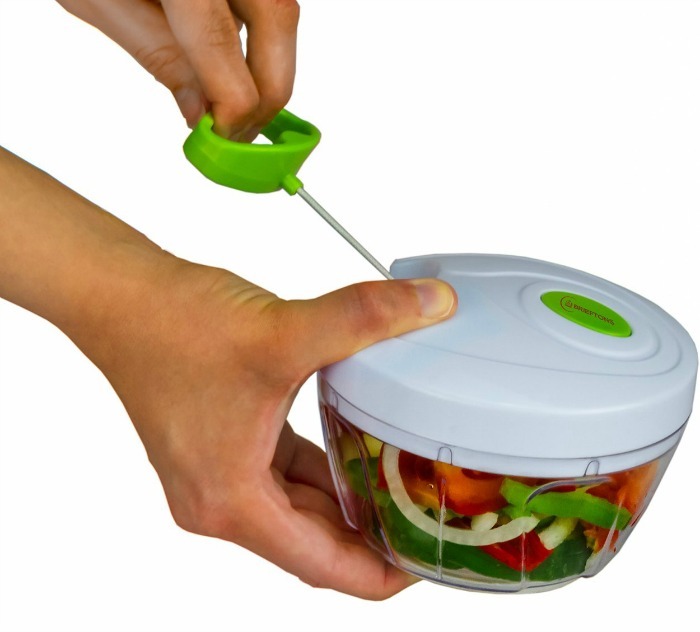 It seems like such an efficient way to chop veggies! I would use the chopper to make my famous homemade salsa…YUM! Hi Cathy. I can see you entered for the other options. If you win, I will email you for the address. I would chop up some veggies for my spring salad. I would use it for homemade salsa, yum! i ate a chocolate truffle cookie thing that someone made using one of these to chop the Oreos… so that is what i would make first!!! I would use it to make my homemade coleslaw. I would make the pinapple salsa and many others. Oh so many things.